Wed, January 23, 2019 1:30 P.M.
Philadelphia FIGHT, 1233 Locust St. In the 2019 One Book, One Philadelphia featured novel, Sing, Unburied, Sing, stories are connected through a song without words. 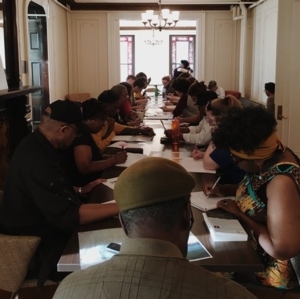 In this public writing workshop, we’ll use deep-listening activities to write untold stories and hear the perspectives of others. Connect with individuals and families who have been impacted by mass incarceration at this session, which is part of a series. Click to to RSVP for this free workshop held at Philadelphia FIGHT's Institute for Community Justice.